When your wedding preparations are on full swing, it is quite easy to forget about some little details. But these little things can have a major impact on the main day. 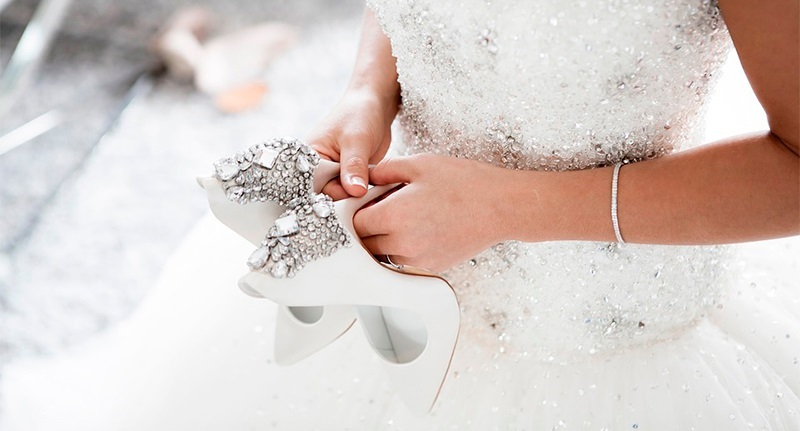 You must have already gotten your wedding dress, accessories and even your bridal veil that are to die for, but what about your wedding shoes? You can think of dusting a pair of your old party shoes for the occasion, but wouldn’t you want everything on your wedding day to be extra special? You should definitely buy a new pair of shoes that are just meant for the day. Just going to the store and buying the first pair of wedding shoes you see won’t do. You need to find the perfect shoes just like you found the perfect dress. Here are a few tips that will help you make the best decision. The first that you must consider really is your budget. There is always going to be something that is going to be out of your budget. So you need to set a proper amount that you can spend for on your wedding shoes alone, without going bankrupt. You can look for your shoes in appropriate stores or even online sites which fit your budget. Even if you have a small budget for the shoes, you can get great ones in the street market which won’t make you compromise on style. When you go shopping for your wedding shoes, you might not think much about the style of your wedding venue. But you should do so. Just blindly buying the prettiest shoes you lay your eyes on might cause you a lot of trouble later on. For example, if you are planning on a beach wedding where you have to walk on an aisle of sand, doing so would be quite difficult if you get stilettos for your wedding shoes. You should always get a pair that you will be able to wear comfortably throughout the wedding ceremony. You should opt for flats or chunkier heels if you plan on hosting an outdoor ceremony or reception. But if you will be mostly walking on marble or glossy hardwood, then you can buy whichever kind of shoes your heart desires. One more important thing you need to consider is your wedding dress. You will obviously need to wear shoes that will complement your wedding dress; otherwise you might end up looking bizarre on one of the most important days of your life. You can’t obviously wear your wedding dress to the shoe store or carry it with you. So instead you can take a picture of the dress and bring it along. This way you will be able to imagine how the whole ensemble looks together. You can also match your wedding shoes with the theme of the wedding. But overall you should get the shoes that make you feel like you and makes you happy. After all it is your wedding, you can do whatever you want to make the day perfect for you. Why a skincare routine is important? How to Find the Best Laptop Bag?